Geology Vertical cliff formed by the Main Limestone with chert strata above, with scree and terrace formed by the Underset Limestone below. 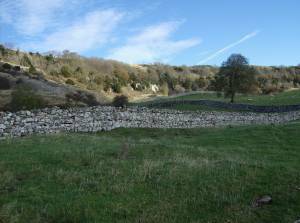 At least two faults have dislocated the limestone strata and may have been mineralised and worked for lead. 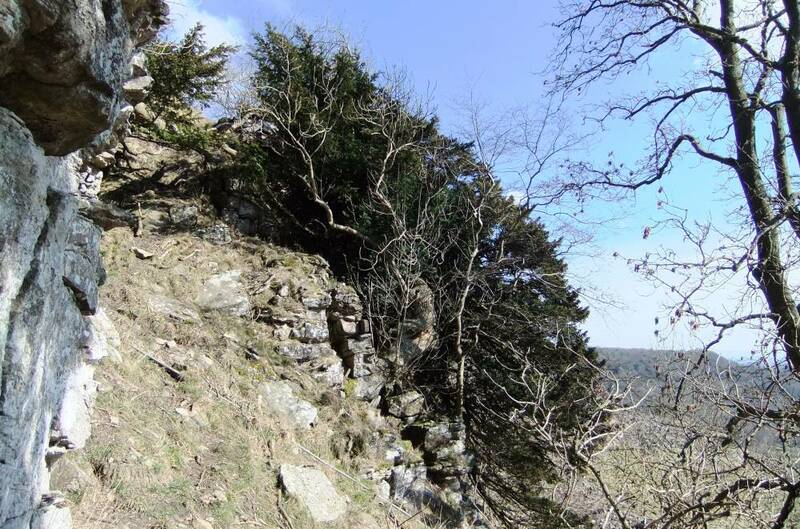 One of these faults forms a small gulley providing the only difficult access up or down the cliff. Record Description Whitcliffe Scar forms the northern edge of Swaledale and extends eastward from Deepdale,the steep sided tributary valley through which runs the access road to East Applegarth, and beyond Willance's Leap towards Richmond for a total distance of 1.5km. 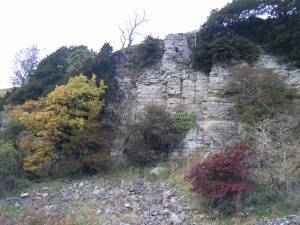 For clarity sake,the woodland on Whitcliffe Scar will be described in three sections. 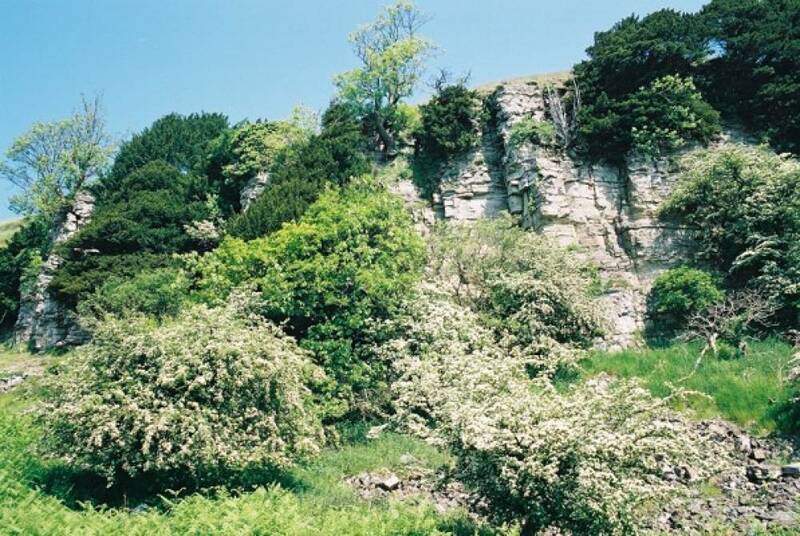 This record provides a brief descriptive and photographic record of the mixed deciduous woodland vegetation on the western section of Whitcliffe Scar, within designated CROW Access Land. 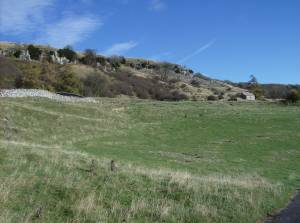 This section of Whitcliffe Scar has been and is open grazing land. Here, Whitcliffe Scar (or cliff) is formed by the Main Limestone and the woodland described grows on the top edge,on the face of the cliff and hawthorn scrub with occasional large ash trees on the talus scree slope below the cliff. 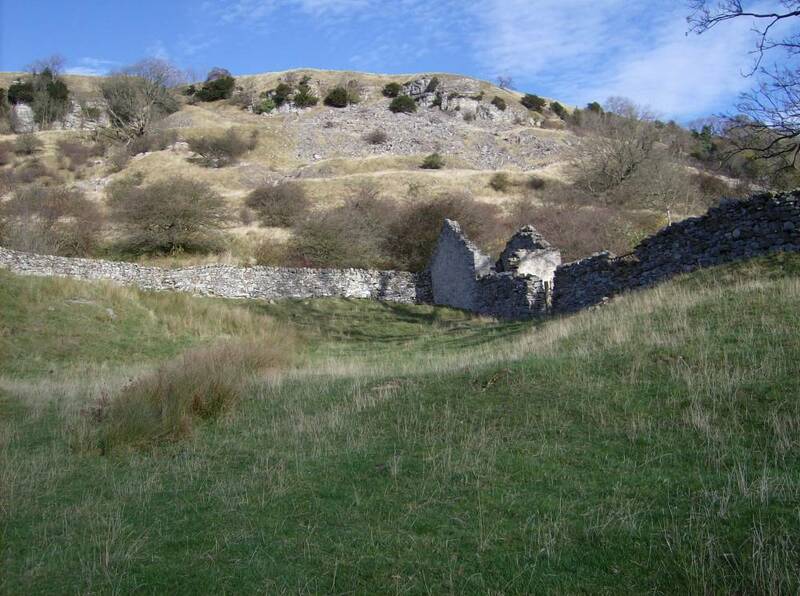 The small Scar on the eastern end of Deepdale (Deepdale Low Scar) has been recorded seperately, see . 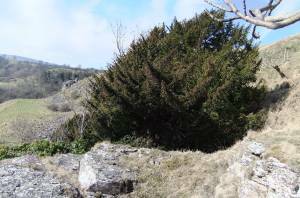 The woodland on and below the western section of Whitcliffe Scar cliff is predominantly of yew with occasional ash,wych elm, oak, blackthorn and hawthorn. Rowan and hazel are present but scarce. Sallow, gean or wild cherry and bird cherry are present further eastward on Whitcliffe Scar but have not been recorded on this western section of the Scar. 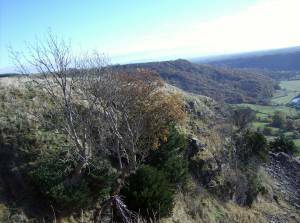 It is intended that the photographs below will provide both panoramic and close views of the Scar and also pictorial record of the woodland as it can be seen at present. 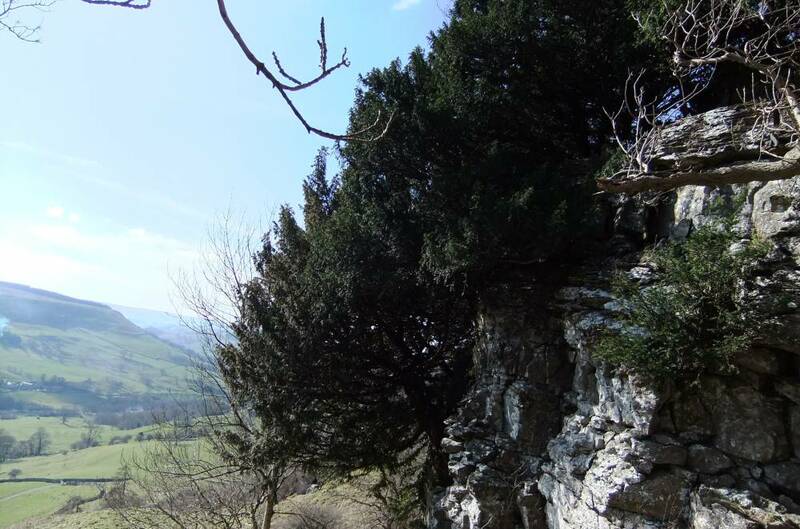 There is some sense in choosing to use photographs to show the trees, since they grow in an extreme environment and are subject to wind and rabbit damage, virus attack and other disease leading to catastrophic change- for example to Elm Bark Beetle attack which wiped out most of the mature wych elms. Close observation shows that the 'dead' wych elm trees were not dead at all and healthy young wych elm saplings can now be seen to have risen, like Lazarus, from the roots and stumps of the elms. 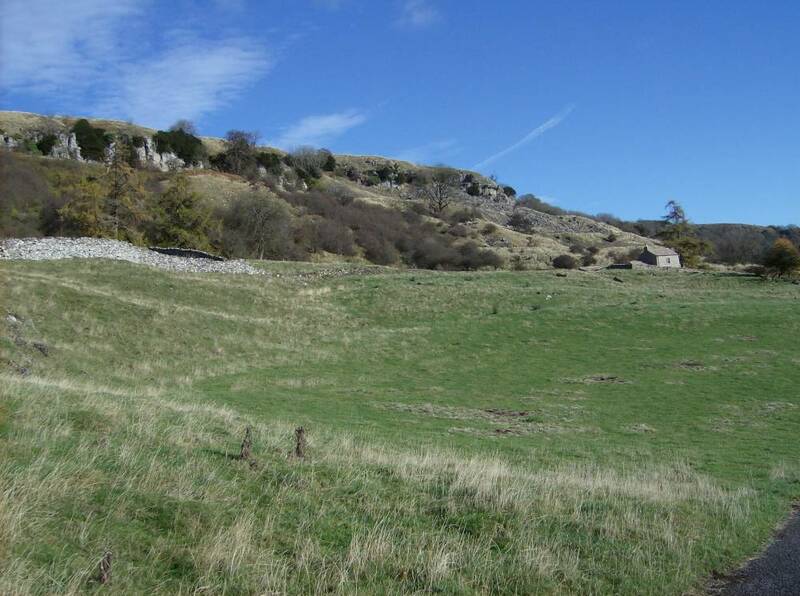 Dimensions The western section of Whitcliffe Scar is approximately 500m in length. Additional Notes This record should be regarded as incomplete and work in progress. 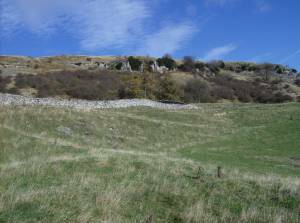 Whitcliffe Scar has a species rich limestone flora and it is hoped that a complete plant list will be appended to this record in due course. 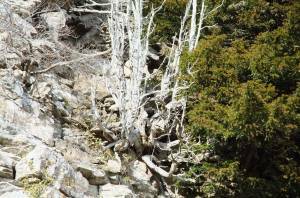 Trees of exceptional size and age. 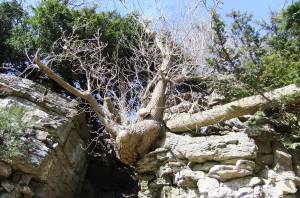 In general, the largest and oldest trees grow directly from the face of the limestone cliff or on the scree slopes directly below the cliff.These trees are more or less inaccessible and have not been cut for economic use. 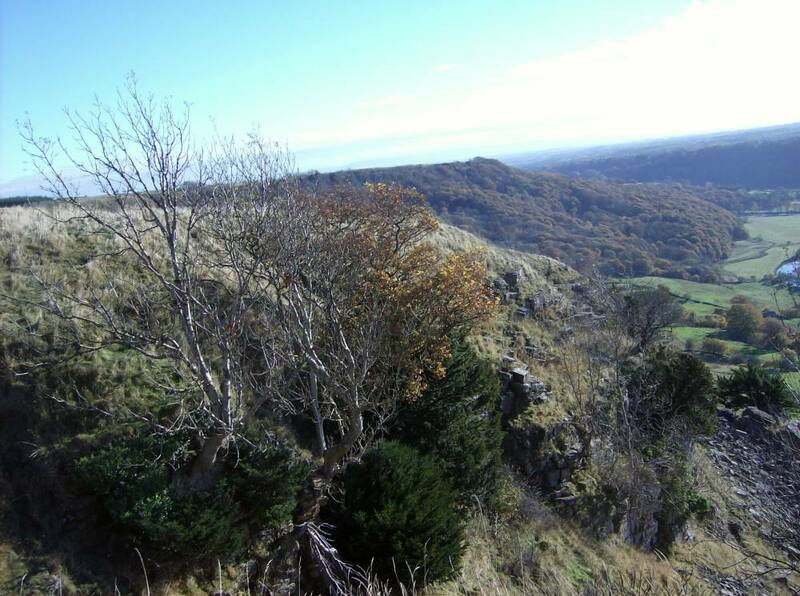 A small number of individual trees of exceptonal interest have been recorded on Whitcliffe Scar West. 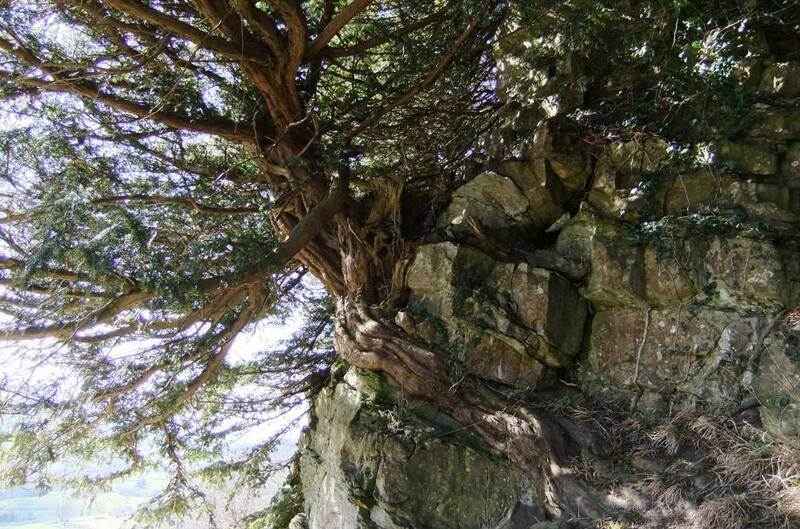 These include: Yews. 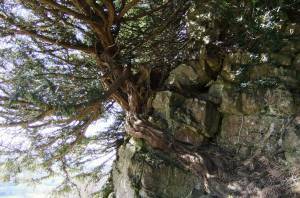 A very large and ancient multi stemmed yew (photos 558,559) yews with exposed root systems, (photos 560,561), a stunted yew at the top of the cliff,(562)and a healthy yew at the top edge of the cliff (563). Ash trees. 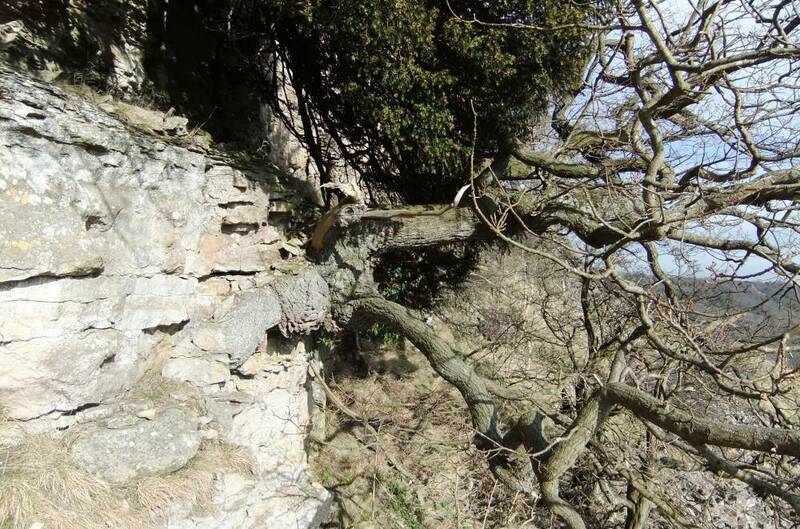 A very large self coppiced ash tree on the face of the cliff (photos 564,565. An ash tree with exposed root,(566,567) and an oak tree with an enlarged base which also grows directly from the face of the cliff (photos 568, 569). Safety Note! 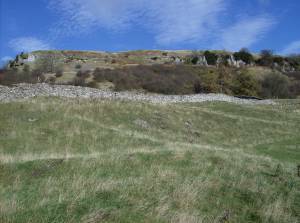 All the limestone cliffs of Swaledale, and especially Whitcliffe Scar, are dangerous places and should always be approached with extreme care. However these cliffs can be viewed with care from below and at view points on the Public Right of Way which runs the length of the cliff. The edge of the cliff is surmounted by a steep and difficult grass covered slope which should not be approached by the inexperienced walker. Image 1 Description Whitcliffe Scar West in May. Image 2 Description Whitcliffe Scar West, at junction with Deepdale Low Scar. Seen from south. 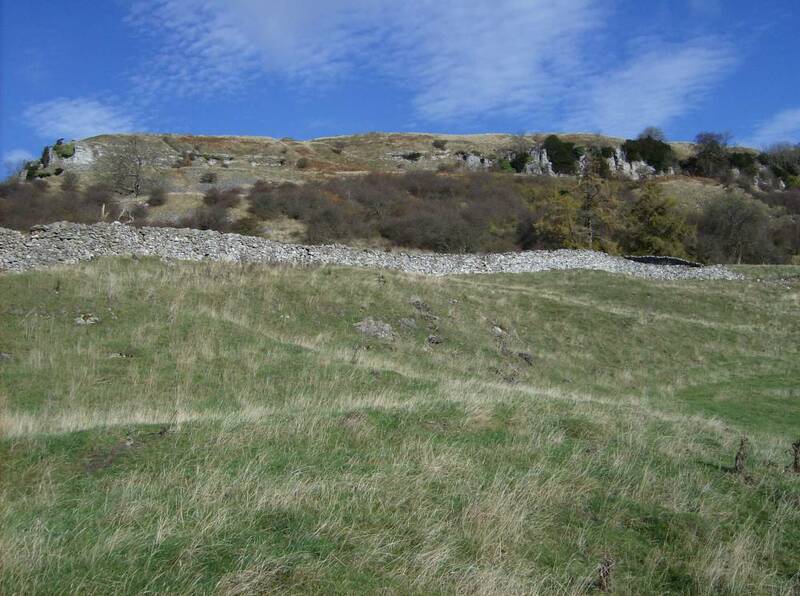 Image 3 Description Whitcliffe Scar West from below, view northward. Image 4 Description Whitcliffe Scar West. 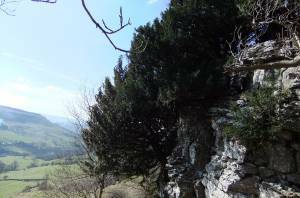 The face of the Scar, the steep grass covered chert slope above and the scree and talus slopes from below. Image 5 Description Whitcliffe Scar West. View westward from top of Scar. Image 6 Description Whitcliffe Scar West. 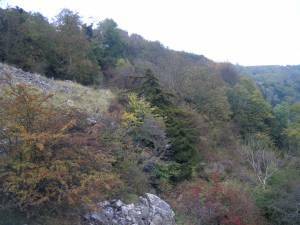 View eastward across Whitcliffe Woods from top of Scar with yews, ash and oak in foreground. Image 7 Description Whitcliffe Scar West. Face of the Scar in autumn with yews, wych elm, oak, ash, elder and hawthorn. 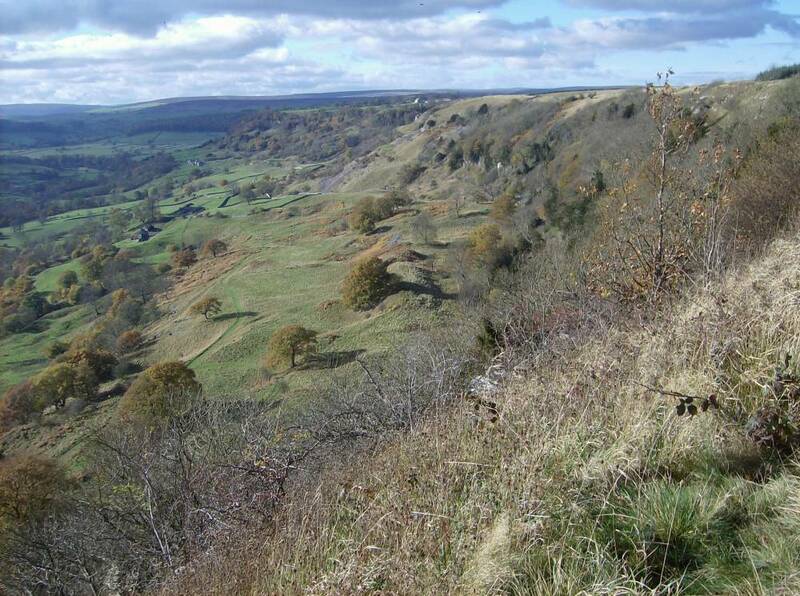 Image 8 Description Whitcliffe Scar West.View northward towards Willance's Leap and Whitcliffe Woods. Image 9 Description Whitcliffe Scar West. Dense woodland at eastern end of west section. Image 10 Description Whitcliffe Scar West Section with scree, terrace and hawthorn scrub on talus slopes below. Image 11 Description Yew on face of cliff. Image 12 Description Detail of previous yew showing very large multi stemmed base. 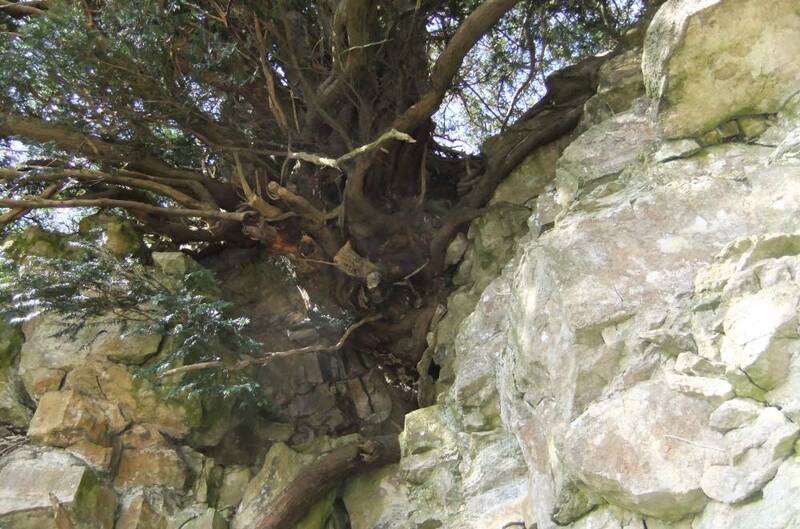 Image 13 Description Yew with exposed root system on face of cliff. Image 14 Description Yew with exposed root system on face of cliff. Image 15 Description Petrified skeletal remains of small stunted yew at top of cliff. These stunted multi stemmed yews may be of great age. Image 16 Description Healthy yew at top edge of Whitcliffe Scar West. Image 17 Description Ash with enlarged bole on face of cliff. This tree has been coppiced by the wind. Image 18 Description Ash with enlarged bole on face of cliff. detail. 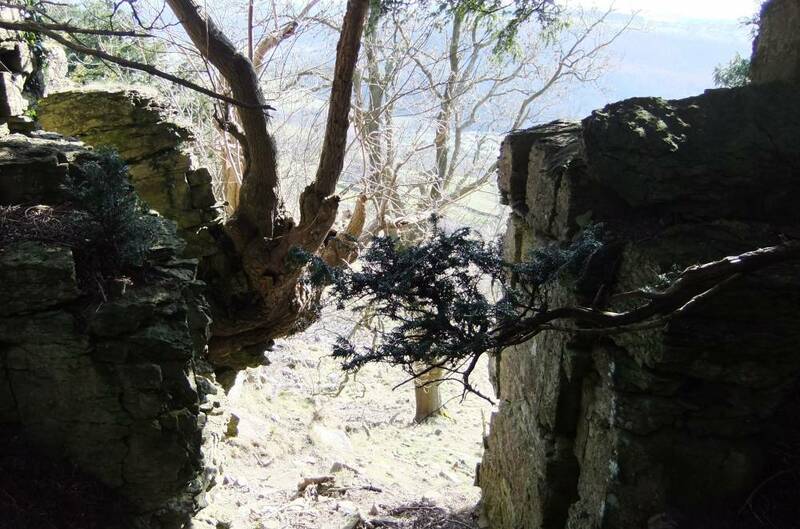 This tree has been coppiced by the wind. Image 19 Description Ash on cliff showing destabilising effects of the tree roots on the rock strata. 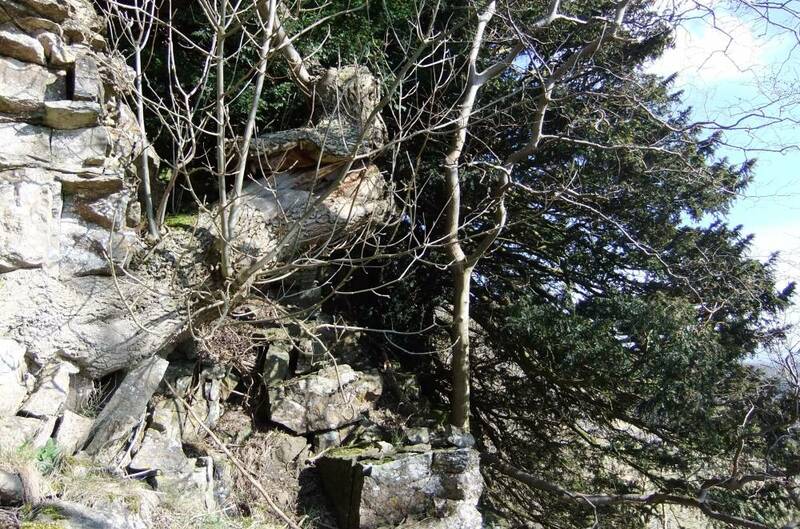 Image 20 Description Oak with enlarged base on face of cliff.